Well I am really happy that finally my work on Enhanced Pageblocktable is almost complete.The Sortable Pageblocktable component is now Enhanced Pageblock table with added functionality of pagination , athough the Sortable Pageblocktable component still exists. 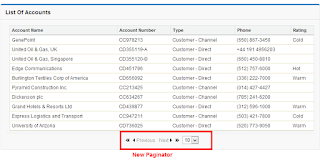 Now you can add functionality like pagination, sorting without any extra coding.The component uses the jQuery table sorter plugin to add the sorting and pagination features to the page block tables. Sorting : Supports sorting of columns by clicking at the column header. 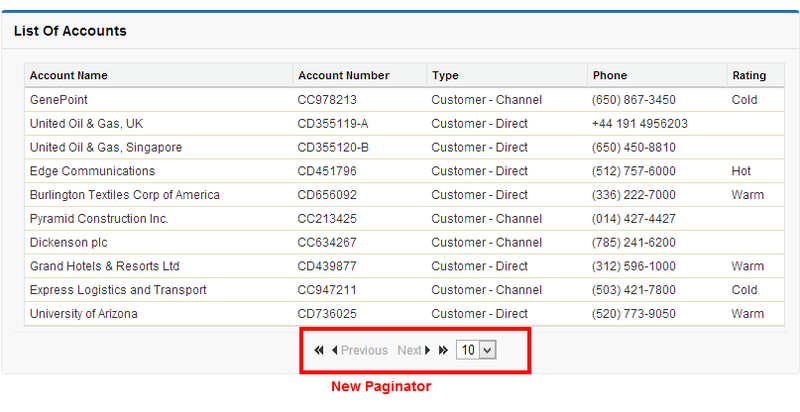 Pagination : Supports client side pagination of the table. Native Look And Feel : Enhanced Pageblock table component uses the similar look and feel of a standar pageblock table and mixes with the existing UI easily. Pretty Simple!, just use the below code. Hi - Currently the number of records displayed defaults to 10. How can I change this to 20, 30, or 40? I see the dropdown selection to change the number of records displayed after the initial page load, but I'd like it to default to a different number (when it first loads). I have same requirement like above some thing extra, to provide Check box for each record. So can you suggest me how to provide check box in this enhanced table. Awesome Post, But I have requirement to open the individual record by click on link of the record like href link, please suggest thanks.